Since we have had the caravan our wine cabinet has been a mess. We only really use the cabinet for holding the glasses when we are in transit. While on site the glasses and mugs are usually on the side ready for instant beverage relief. Transporting the mugs has always included a process of packing them in a way that they won’t move around or worse break while being bumped about. I have always thought of creating a nice mug and glassware container to fit the wine cupboard and now I have finally gotten around to completing it. I used the same material I used when mounting the LEDs. This is Foam board. It’s pretty inexpensive can be cut using a sharp art knife and is strong enough to withstand some knocks and bumps. Better still, because it’s so easy to work with and glue together, you can make any installation fit any space you have. So, fir instance, if you wanted to make a sock tidy, you can. 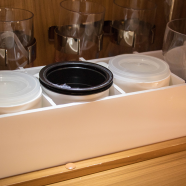 Maybe a glasses tray that fits in a locker, or even better maybe a separator to hold plates apart so they don’t crash into each other. Below is a video of what I created, and at the bottom of the page is a list and links to the materials I used to create this holder. Hi Dan great tip this one but how do I leave any comments on your YouTube channel. Think I have looked at all your videos now you do post some great ideas a BIG THANK YOU as they have helped me out as a newcomer to caravaning community. Hi Mark, Thank you for your kind words, that is genuinely appreciated. You should be able to leave a comment on any of our videos, just log into YouTube and add any comment you wish. Hi Dan and family my wife and I are new to caravaning this year and your videos have been instrumental in helping us to get things right first time. A pleasure to watch and learn from. Very many thanks for all the effort you put in.